Mobile IV therapy solution Hydreight recently upgraded its main online platform. The new and improved website caters to customers of the innovative IV infusion service as well as to potential service and business partners. Las Vegas, NV, United States - October 4, 2018 /MarketersMedia/ — October 1, 2018 – The innovative mobile IV therapy solution that is revolutionizing self-care has a new and updated website for customers as well as for potential service and business partners. 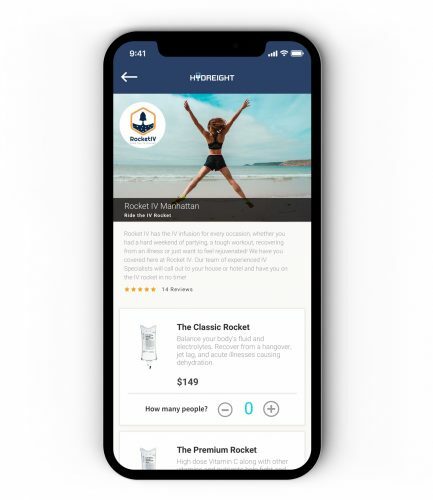 Using a mobile application, Hydreight allows customers to book nearby IV specialists—who will go to them wherever they are—for an IV therapy session. IV therapy is the process of directly administering vitamins and minerals into the bloodstream. It is known to help flush out toxins in the body, promote faster recovery from flu symptoms, boost the immune system, rehydrate muscles, and recharge the body. Alternative treatment experts have reported that IV therapy is effective in helping people who are suffering from fibromyalgia, chronic fatigue syndrome, asthma, migraines and acute muscle spasm, among others. Hydreight offers on-demand IV therapies for detoxification, hydration and rejuvenation; increased metabolism and weight loss; pre- or post-performance energy boost and recovery; and for recovery from jet lag, hangover and acute illnesses. All therapies are administered by highly skilled and licensed healthcare professionals. Customers can pay in cash or via any major credit card. The new website is also a portal for interested and suitably qualified medical professionals who want to join Hydreight’s growing team of IV specialists. Potential strategic area partners can also check out Hydreight’s new website to find out how they can take advantage of Hydreight’s well-oiled revenue machine. As an area partner, interested parties can buy into a specific geographical area—forging strategic partnerships with fitness centers, small to medium enterprises and large corporations—while Hydreight takes care of all the back-end services to convert leads into profit. Las Vegas, Nevada 89145 or call directly at 702-726-6704.